MAITAKE MUSHROOMS from Mushroom Wisdom U.S.A. In the orient, some mushrooms are highly regarded as longevity herbs that preserve youth and maintain health. There are many folklores or anecdotes on such mushrooms. Traditional healers in china, Japan and other parts of Asia have prized and recognized the health enhancing potential of the mushroom even considered as a food of immortality. Yet the scientific study of the mushrooms has only begun during the last twenty years. Researchers have found that some mushrooms are rich in minerals( such as potassium, calcium and magnesium), various vitamins ( D2,B2 Niacin and C), fibres and amino acids. Another important ingredient especially found in the family of polyporaceae (so called “Monkey’s Bench” is a polysaccharide compound which exhibits strong immune activity). Maitake in indigenous to the north-eastern part of Japan. For hundreds of years, this rare and tasty mushroom has been prized in traditional Japanese herbology. This mushroom has a rippling form with no caps and grows in clusters at the foot of Japanese oak trees, giving it a image of butterflies dancing to the Japanese eyes, thus named ” Maitake” – Literally “dancing mushroom”. Others say that Maitake is so named because people who found it in the deep mountains knew its delicious taste and health benefits and thus began dancing with joy. In fact, in the feudal era of Japan it was exchanged with the same weight of silver by local lords who in turn offered it to their boss; the SHOGUN. The botanical name of Maitake is ” Grifola frondosa” referring to the mythical beast which is half-lion and half-eagle. Maitake is the only edible mushroom among all Monkey’s bench family.Sometimes it grows over 50 pounds. That is why this giant mushroom is called the ” King of Mushrooms”. Maitake seems to be one of the most extensively researched herbs and a number of research papers have been published by various institutes and universities. The health benefits demonstrated by Maitake include immune system support, normal blood pressure support, normal blood sugar metabolism and normal cholesterol support. Further laboratory studies and extensive clinical studies are under way in collaboration with leading research institutes both in Japan and the United States. MAITAKE D-FRACTION®, ONE and ONLY. MAITAKE D-Fraction has been developed and commercialised by Maitake Products, Inc. Since 1955. ‘Maitake D-Fraction ® a registered trademark for the standardized extract from maitake mushroom, contains the active ingredient; protein b-glucan complex. This unique active compound makes it very potent in enhancing immune system by oral administration. Being liquid in vegetable glycerin (alcohol free), “Maitake D-fraction ® can attain a much fater and much more effective absorption by the body. B-Glucan in Maitake mushroom has b-1,6-glucan with b-1,3 branches and b-1,3-glucan with b-1,6 branches. Researchers theorize that this complexity of the b-glucan branching makes Maitake superior to other medicinal mushrooms in immune stimulatory effect. One of the difficulties with many of the medicinal mushrooms is that they lose much of their effectiveness when taken orally. An essential point about Maitake D-Fraction is that current research indicates it is most effective when taken orally. 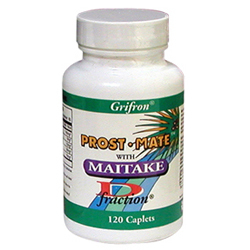 The professional version of “Maitake D-Fraction ®”; “Grifron®-Pro D-Fraction®” has been used at the Cancer Treatment Centers of America( CTCA) since 1993. At that time DR Robert Atkins M.D., known as the ‘pantheon’ of the Alternative Medicine in the U.S.A., began using it at the Atkins Center in New York City for the treatments of various cancer patients. When ‘Maitake D-Fraction®’ received some strong support by DR. Andrew Weil M.D., this product became known among doctors in Alternative Medicine. “Grifron®-Pro D-Fraction®” has received IND(Investigational New Drug Application) approval from the FDA( Food and Drug Administration) to conduct a phase 2 study in its effects for advanced breast and prostate cancer patients in 1998. Phase 1 study for toxicity has been exempted due to the established safety records both in Japan and the U.S.A. Meanwhile, a researcher group of the Department of Urology at NY Medical College has announced the “apoptosis( programmed cell death) inducing” activity by Grifron®-Pro D-Fraction®” on human prostatic cancer cells in late 1999. This finding has been published in Molecular Urology ( vol.4, No.1,2000) and paid keen attention in cancer research and treatment. ” Maitake D-Fraction® is the registered trademark of Maitake Products, Inc. ” Maitake D-Fraction® is registered with the U.S. Patent and Trademark Office as of October, 1996 for the standardized maitake extract product that has been on the market place since the previous year. There is some misunderstanding among some people or even professionals in the U.S.A that ‘ Maitake D-Fraction® may be a generic term of the active ingredient in the Maitake mushroom. Please do not be confused. It is the trademark for the product originated and developed by Maitake Products Inc. The active compound of maitake mushroom is a polysaccharide called b-glucan which is found in other medicinal mushrooms such as Agaricus Blazei and Reishi. The b-glucan contained in ‘Maitake D-Fraction®,’ however, is water-soluble and has some unique chemical consisting of both b-1, 3-D-glucans with branches of B-1, 6-D-glucans and b-1,6-D-glucans with the branches OF b-1,3-D-Glucans. This unique character has made it distinguished from other b-glucan products on the market, either derived from other mushrooms or yeasts. Unfortunately, some imitation products of out Maitake D-Fraction®’ are seen on the market these days under the trade names such as “Super D-Fraction,” “MD-Fraction,” etc. Some of these imitations contain little if any amount of B-glucan. Please make sure the label on the product indicates “Grifon®” to obtain the assurance of the high quality and highest standard behind the science. In clinical trials MAITAKE D-Fraction has been shown to have an anti-tumour effect on tumour-bearing mice, with enhancing cytotoxic activity of macrophages and elevated production of interleuken-1 leading to the activation of cytotoxic lymphocytes (CTL). These findings are highly suggestive that D-Fraction acts not only via direct activation of various immune effectors (macrophages, CTLs, NK) targeting tumour cells but also via potentiating the activity/production of various lymphokines. Thus, D-Fraction appears to have a potent immunostimulatory activity, which may account primarily for its anti-tumour effect on cancer cells. A trial by Dr. Nanba used in conjunction with the chemotherapy drug mitomycin (MMC) appeared to increase the tumour shrinkage ability, demonstrating an apparent synergy but at the same time reducing the side effects of the chemotherapy, eg nausea, hair loss and leukopenia (deficiency of white blood cells). Maitake D-Fraction is one of the few natural products to be approved by the FDA (Federal Drug Administration USA) for IND (Investigational New Drug Application) clinical studies for advanced cancer patients.(IND#54589). D-Fraction consists of highly standardised and purified active beta-glucan (3-branched beta-1,6glucan and 6-branched beta-1,3 glucan) and approximately 30 % of protein extracted from Maitake mushroom fruiting body. 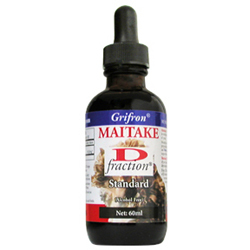 Grifron Pro D-Fraction is a standardised extract developed exclusively by Maitake Products Inc. in collaboration with researchers. For general use as a dietary supplement,5-6 drops of Grifon®-Pro-Fraction three times daily between meals. (One drop contains approximately 1.1 mg of pure Maitake D-Fraction). P O Box 161 Waipawa Hawkes Bay 4240 , New Zealand.